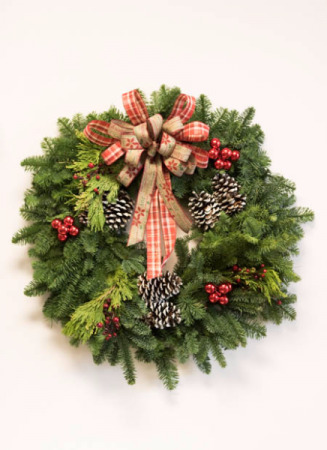 Holiday Wreath perfect for someones front door or as a wall decoration or even for your own home. 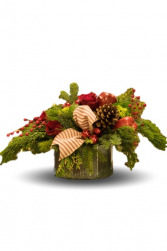 Our signature "Cottage Christmas" is filled with Evergreens, Roses, Pine Cones, Berries and more for a cottage feel in a corrugated tin container. Container is 6" around. Upgraded prices include more flowers and are designed to keep the same look and feel of the arrangement. 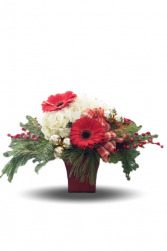 Celebrate the rich feelings that the winter months, and holidays, usher in with this beautiful arrangement! Whether you send it as a gift, or buy it to spruce up your own home, you won't be disappointed. Container is 5" tall. Upgraded prices include more flowers and are designed to keep the same look and feel of the arrangement. 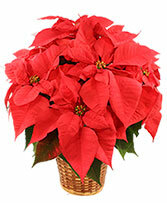 $35 is a single 6" poinsettia in a basket. $65 is a single 8" poinsettia in a basket. $85 is two 6" poinsettias in a peanut basket.